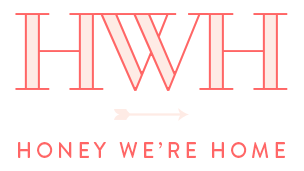 Thank you for weighing in on the dining room pillow dilemma yesterday! I love hearing your opinions and I’m liking the suggestion of using the yellow for now since it’s summertime, and using the brown come fall. I plan to style the table soon and show you how it turned out. 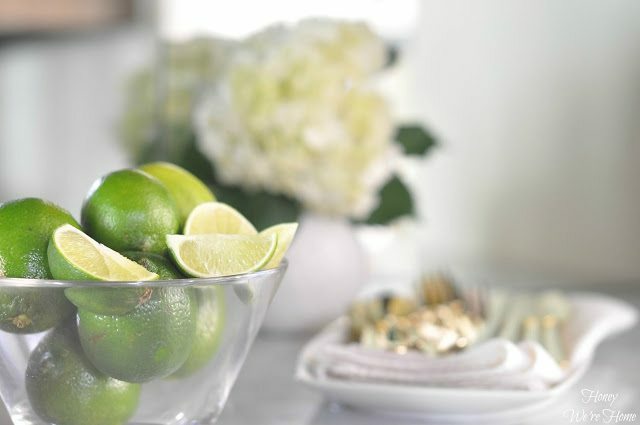 Today, I’m turning my attention to the area just next to the dining room- the butler’s pantry, and specifically, the bar. I’m a big fan of bar carts and bar styling, but have never really “styled” our bar area until recently. It’s fun to play around with the different bottles and accessories and see how it looks. 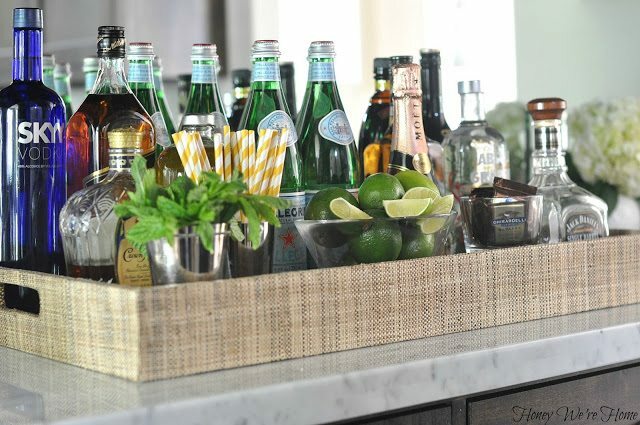 The Raffia tray is from West Elm (18 x 28) and their mirrored trays are awesome too. If you don’t have a bar countertop, the West Elm tray comes with a sleek stand that you can make into a bar cart. When our house was first built, the back cabinet wall was just drywall, but I had the mirror added and it made such a big difference in reflecting the light from the windows. 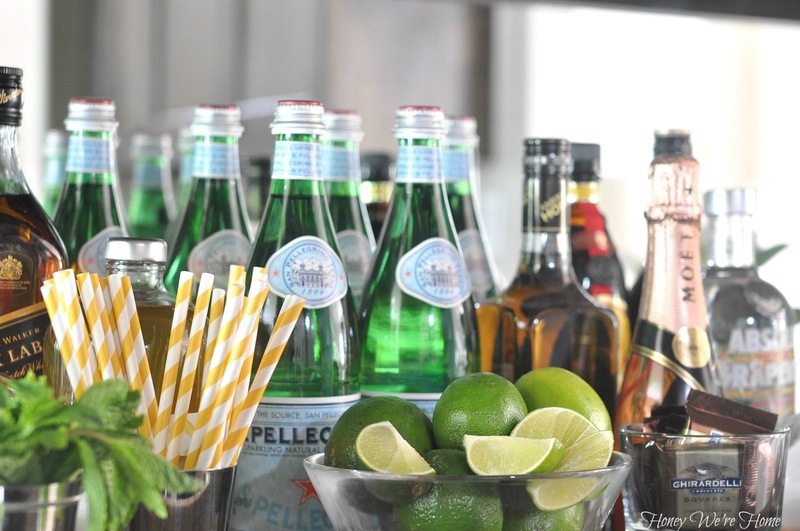 In setting up my bar, I started with six bottles of Pellegrino water for height and because I love the green color. Then I layered in other liquors, keeping the tallest at the back and the shorter ones toward the front. At first, my tray was too crowded, so I moved some of the alcohol to a lower cabinet. I didn’t want it to look cluttered. 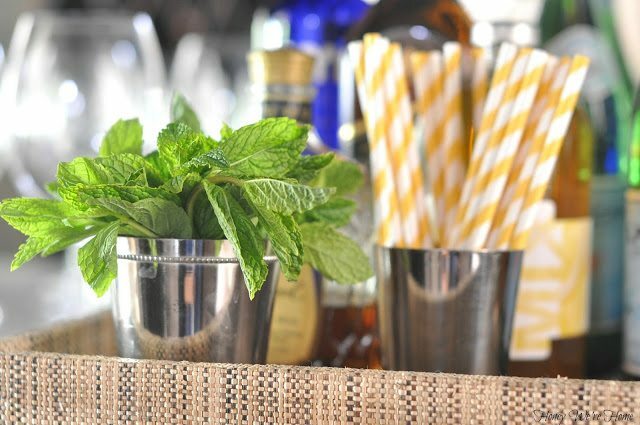 A bunch of mint adds a live, green element and the colorful yellow and white straws are fun. Mojitos anyone?! The mini silver cups are sophisticated too. Being the chocolate lover I am, I always keep a little treat nearby. These Ghirardelli salted caramel squares are so good! A bowlful of limes is so clean and pretty, but slicing one up made it look even better. 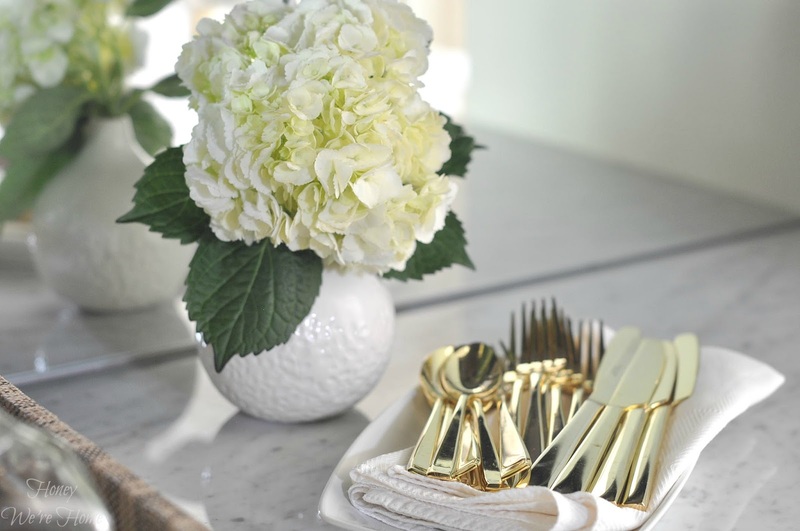 I don’t use our gold flatware very often, so I thought it would be nice to put it out on display. 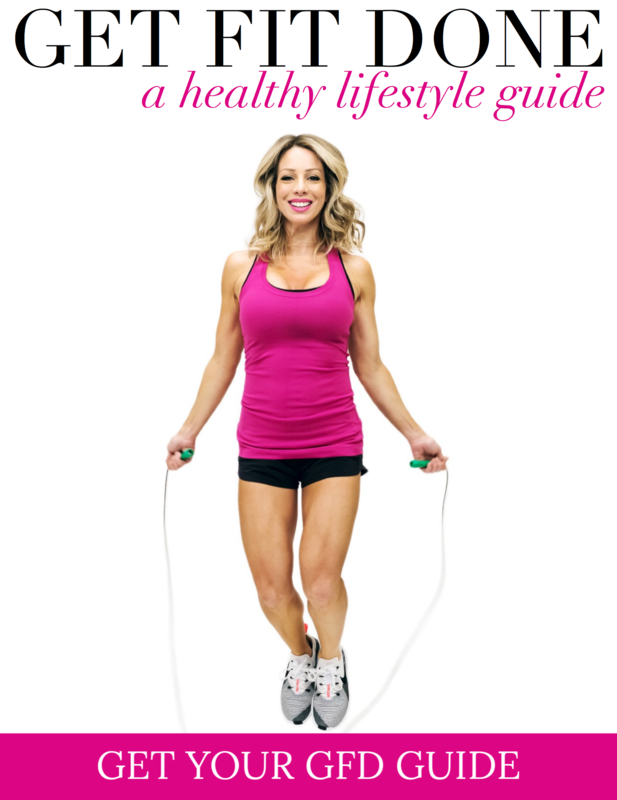 I got mine on Overstock. It’s currently out of stock, but you can sign up to be notified when they restock. West Elm sells a nice set of gold flatware too. Of course, if I can keep the hydrangea alive for more than a few days, that would be great. My favorite thing to drink on this tray is pink champagne. Good times! 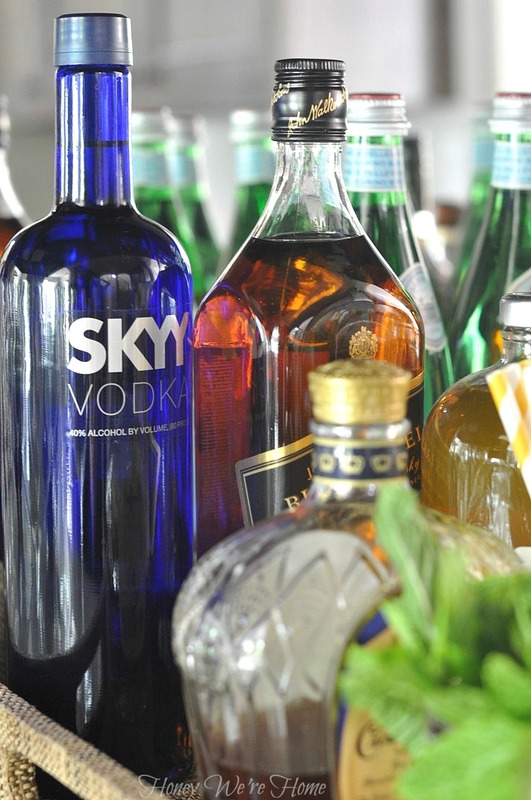 Skyy vodka reminds me of my college days. And I’ve always thought the bottle was so pretty. Are you styling your home bar? 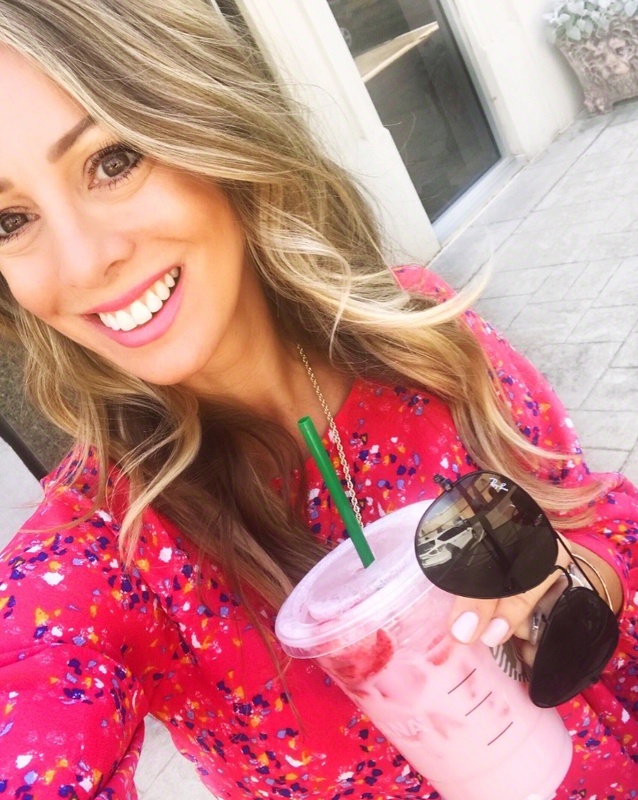 What is your favorite drink?! beautiful pictures! 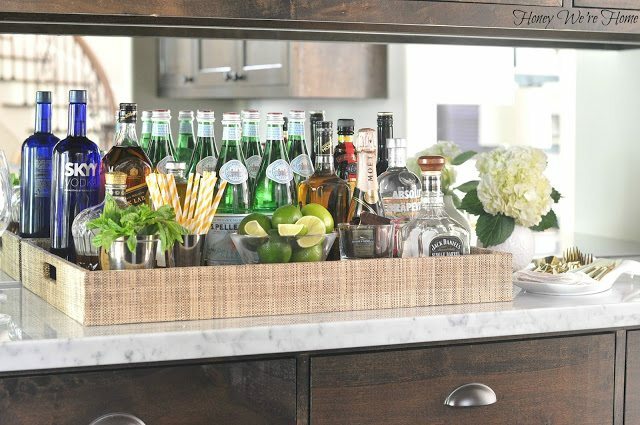 I hope to have room for a bar cart in our next place! Ha! Thanks for letting me know Dana! It all looks beautiful! 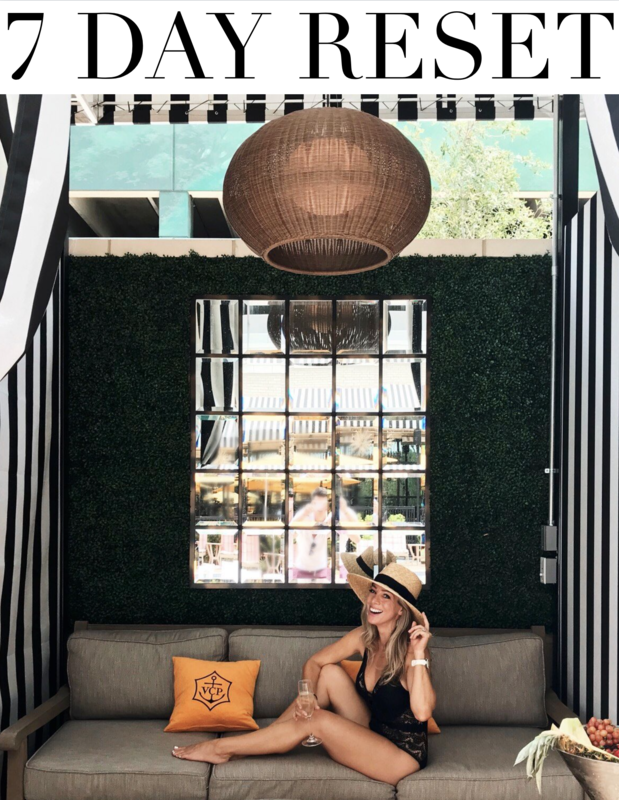 You look like you're all ready for a party 🙂 Anything with Crown is my favorite, although this summer peach vodka has been my go-to liquor. 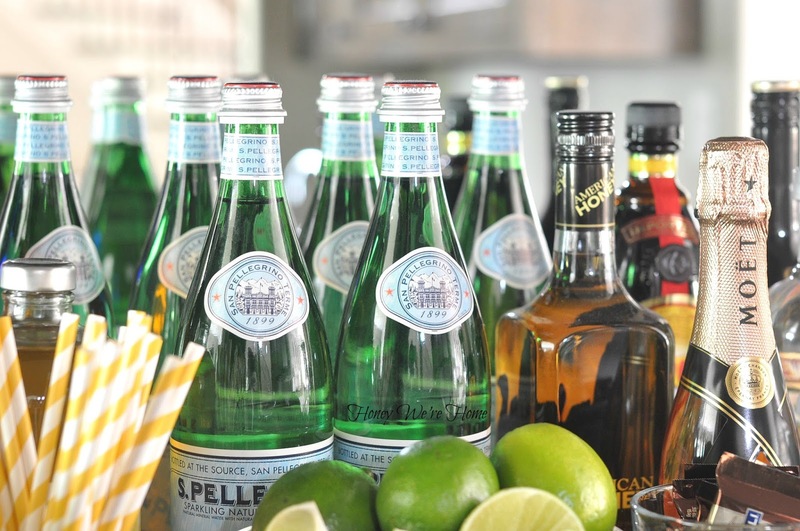 It's so refreshing in spritzers! 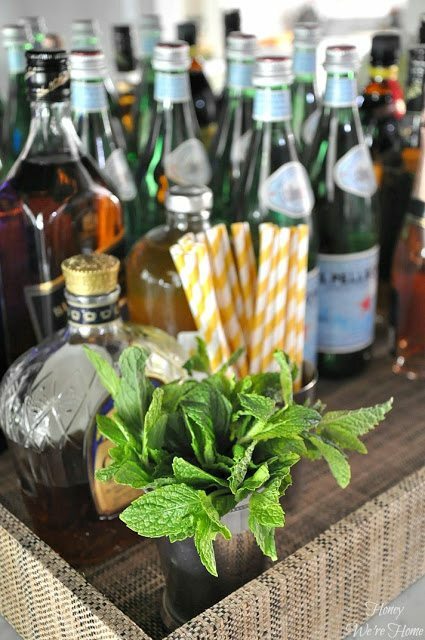 Mmmm, yes please, I will take a mojito. And a chocolate caramel square! This looks adorable. 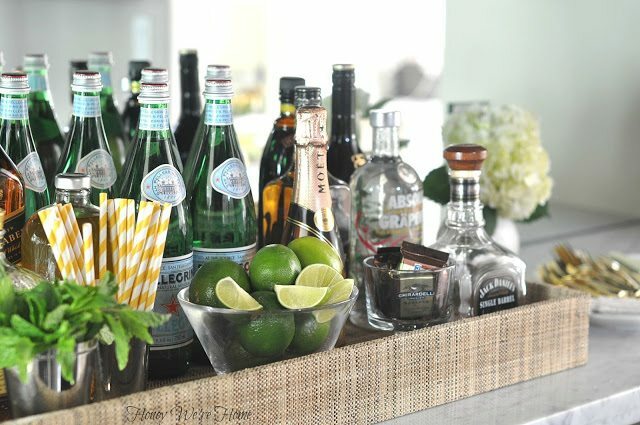 I never know how to put our bar together when I am hosting a party. Maybe it is because ours is awkwardly shaped, but I will have to try grouping things like this. Also, I love the tray! Love it. I need to do something like this in our dining room or kitchen. 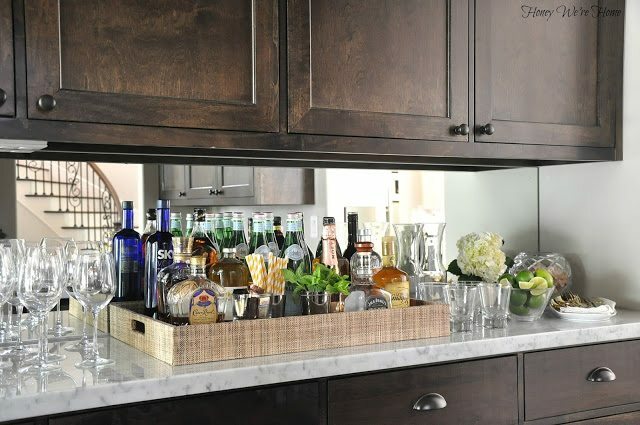 I have bar type cabinets in both and several pretty trays. Question though…while I love seeing all the bottles and pretties displayed on bar carts and such around blogland and pinterest….anyone else wondering how you keep the things from becoming dust magnets. Having to wipe down bottles every week would drive me nuts! Beautiful! Would love to be on that guest list 😉 Pink champagne? Yes please! So awesome. Add me to that guest list too! Love. Not a huge drinker, although I've yet to turn down a Vodka/soda on a hot day;) Love the addition of chocolates! Sweet idea! Looks simple & sophisticated…love it! Looks so so pretty, Megan!! Your styling and photography are amazing!!! Perfect! You did a great job with all the little touches – I love it! 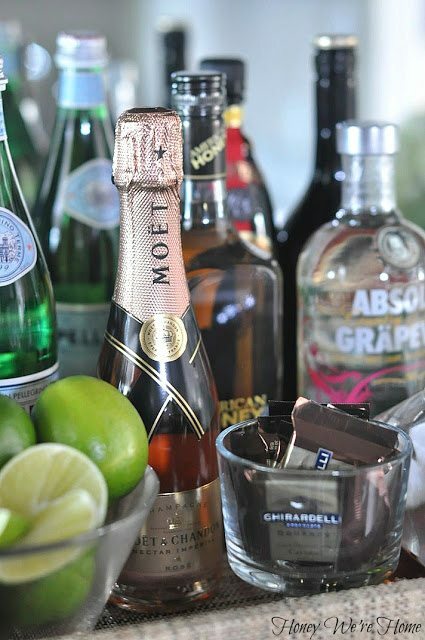 Love how you styled your bar Megan. Very pretty! Would love a glass of Riesling, but, since I'm pregnant, I'll just take the whole bowl of chocolates! Ha! Looks great! 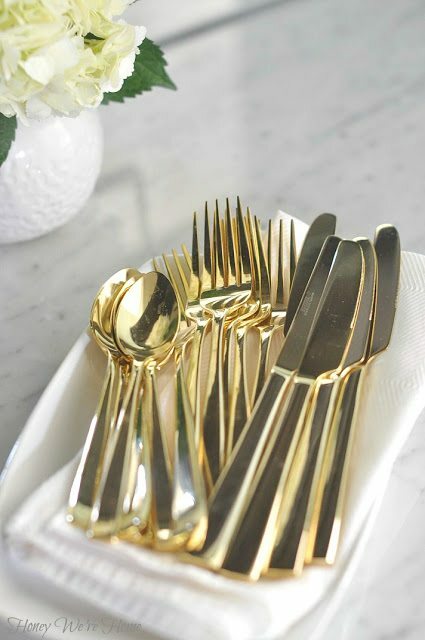 love the gold flatware! i have been wanting the west elm set! but yours is a much better price!